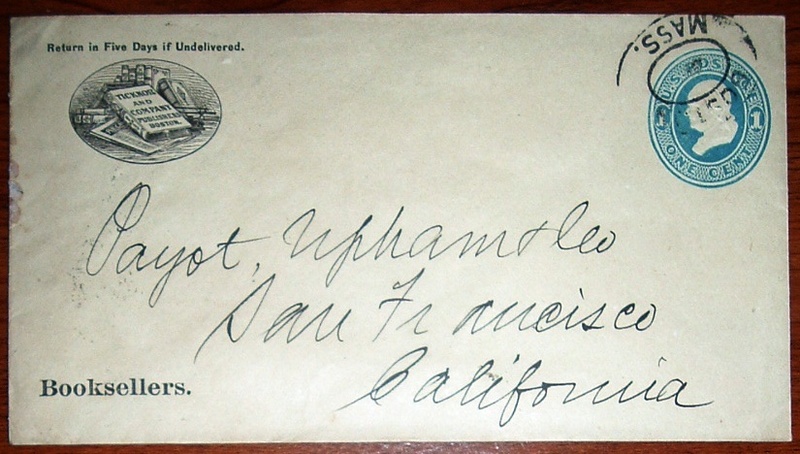 This was a tough one to title because of the two companies indicated on the 1887 postal cover: Ticknor and Company of Boston, Publishers, and Payot, Upham & Co. of San Francisco, Booksellers. Each was important to the book trades on their respective coasts, each was important to the other, and each could have been featured in a separate post. I've written previously about Ticknor and its various business incarnations through the 19th century and beyond, so more attention will be given here to Payot, Upham & Company. However, for anyone interested in Ticknor history, here's a similar cover I wrote about last year, in which some company history is outlined. The covers are quite similar with minor differences in the Ticknor logos. Until 1870, the San Francisco bookselling firm, Henry Payot & Co. dealt primarily in foreign language books from European countries, particularly France. That is undoubtedly owed to the fact that founder Henry Payot was born to French parents. Born in 1838 in South Carolina, Payot came to California at age 13 with his parents during the Gold Rush days. He later worked for lithographers Quirot & Company before starting Henry Payot & Co. and focusing on bookselling and publishing. His company would grow and change noticeably for the better when a young publishing agent, Isaac Upham, would join the firm. As Payot's business focused on books from around the world, primarily Europe, that interest ultimately led to several trips abroad, including Japan, where he lectured in 1907. He had lectured before on Egypt, as reported in the San Jose News in 1901, perhaps from his own travel there. He died in 1921. 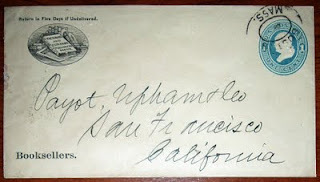 Isaac Upham had been in California since 1860, a transcontinental-transplant from Maine. He taught and served as superintendent for Butte County and Yuba County schools before landing in San Francisco as an agent for the Cincinnati publisher, Wilson, Hinkle & Co.
Just a year later, Upham was in a position to buy a half-interest in Henry Payot's company. His business expertise, particularly with the publishing company, seems to have paid quick dividends. Within five years, the firm of Payot, Upham & Co. began dealing in English language books as well as selling stationery, increased their business significantly, and relocated its headquarters in San Francisco from 622 Washington Street to 204 Sansome Street. The result of these business decisions, with Upham's guidance, positioned Payot, Upham & Co., as one of the largest of wholesale and importing stationery and bookselling firms on the entire Pacific coast. Upham's business acumen extended to other areas, including banking. His book and stationery business continued to prosper and before the first decade was done in the new century, Payot, Upham & Co. was succeeded by The Isaac Upham Company, incorporating in 1909 (The Bookseller, newsdealer, and stationer, Vol. 30, 1909). Unfortunately, Upham wouldn't live much longer to see the company prosper under its new name. In July of 1909, he was riding his bicycle in San Jose and was killed in a collision with an automobile. 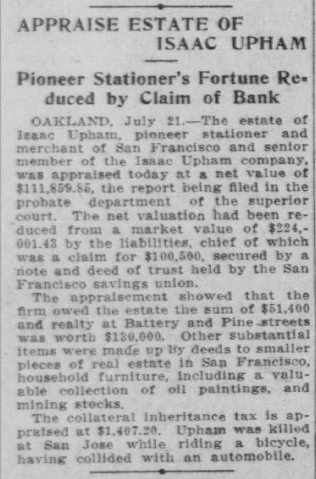 The newspaper article shown at the left is from the San Francisco Call, July 22, 1909, and reports on the settlement of Upham's estate and refers to his death. From his early horse and carriage days on the West coast during the Civil War era, the circumstances of his demise could not have been foretold without a suspension of disbelief in extreme fantasy. Such were the times the span of his years traversed. Charles Hoy Fort was a writer who, after several failed novels, finally found his audience with a nonfiction book titled The Book of the Damned (Horace Liveright, 1919), which is regarded as the first book to deal with the field of anomalistics, or paranormal phenomena. Fort and his writing attracted some very influential literary pals, such as Theodore Dreiser, an old friend who was instrumental in getting Fort's work published. 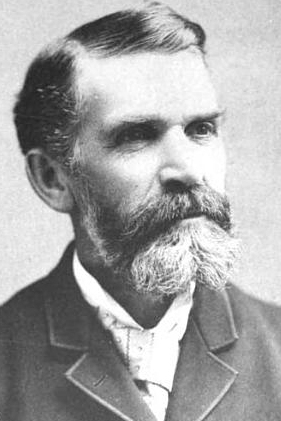 Many others admired his writing and became founding members in a society dedicated to Fort and his works--the appropriately named Fortean Society. Writer Tiffany Thayer started the society. Dreiser served as the first president and they were joined in membership by notable literary figures such as Ben Hecht, Alexander Woolcott, Booth Tarkington, Dorothy Parker, Oliver Wendell Holmes, and H. L. Mencken. Ironically, Fort shunned the notion of such a society and refused to participate beyond the first meeting, in which he was lured to under false pretenses. The Fortean Society continues to this day as The International Fortean Organization (INFO). 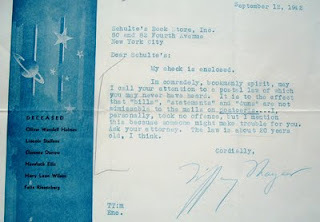 That bit of information sets the stage for another installment from Schulte's Book Store letter archive in my collection. This one is from Tiffany Thayer, who actually founded the Fortean Society to celebrate the publication of Fort's popular Lo! (Claude Kendall, 1931), which Thayer had helped get published. Doug Skinner wrote of this and much more on Thayer in an excellent article for the Fortean Times (June 2005). In comradely, bookmanly spirit, may I call your attention to a postal law of which you may never have heard. It is to the effect that "bills", "statements" and "duns" are not admissable to the mails on postcards....I, personally took no offense, but I mention this because someone might make trouble for you. Ask your attorney. The law is about 20 years old, I think. 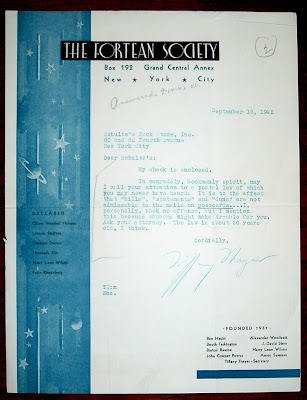 The Fortean Society letterhead that Thayer used provides some nice history for the organization. The left column offers a list of members who have passed on to "the next world," against an artistic backdrop of stars and planets. The list of deceased members is an impressive one: Oliver Wendell Holmes, Linclon Steffens, Clarence Darrow, Havelock Ellis, Harry Leon Wilson, and Felix Riesenberg. 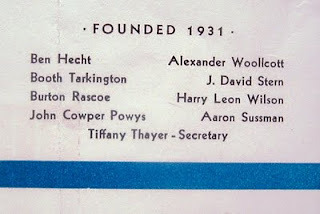 In the lower-right corner of the letter is the founding date (1931) for the society and a list of names that I assume was the founding board, including Tiffany Thayer as Secretary. Again, an impressive list of names from the literati of the day: Ben Hecht, Booth Tarkington, Burton Rascoe, John Cowper Powys, Alexander Woollcott, J. David Stern, Harry Leon Wilson, Aaron Sussman. What is interesting is the absence of a key founder--Theodore Dreiser, the society's first president no less. 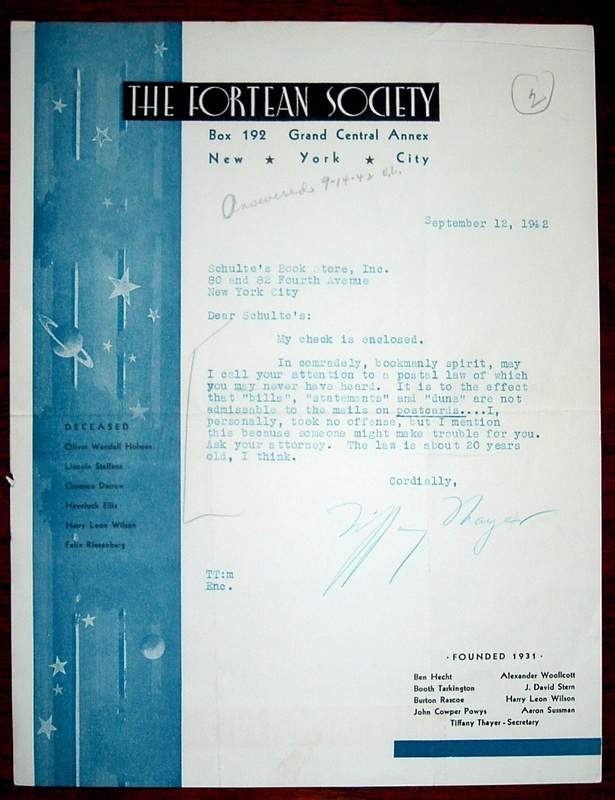 The Wikipedia page for the Fortean Society indicates that Tiffany Thayer became very controlling of the society's direction as well as its newsletter, which he used for his own views. As he drifted from the the original intent of the society, perhaps he and Dreiser got crossways with each other. Thayer reportedly kicked out an entire chapter (San Francisco) from society membership over a disagreement. I did learn from Doug Skinner's article, referenced above, that founding member Alexander Woollcott, who had social ties with President Roosevelt, may have quit the society that year because of a Fortean Society newsletter article penned by Thayer, February 1942, that accused the president of colluding with Japan. But Woollcott's name was still on the letterhead featured in this post, by September 1942. Theodore Dreiser to A. L. R. 1937 Jun 26 TLS. 1 p. Will not take action against Tiffany Thayer, former secretary of the Fortean Society. Says that Thayer has some notes of C. F.'s that should be in a publicly accessible collection, e. g. the New York Public Library. Mentions Ben Hecht and [David] Stern (owner of the N. Y. Post.) Dreiser mentions that he was denied access to the notes. There are other letters in the collection that point to trouble between Thayer and society members, as well as Charles Fort's widow, who sued Thayer for her late husband's notes. Alexander Woollcott to A. L. R. 1937 Jul 4 TLS. 1 p. Lent his name to the Fortean Society, thought its purpose was to call attention to Fort's book. Mentions that Mrs. Fort is suing Tiffany Thayer for the return of Charles Fort's notes. 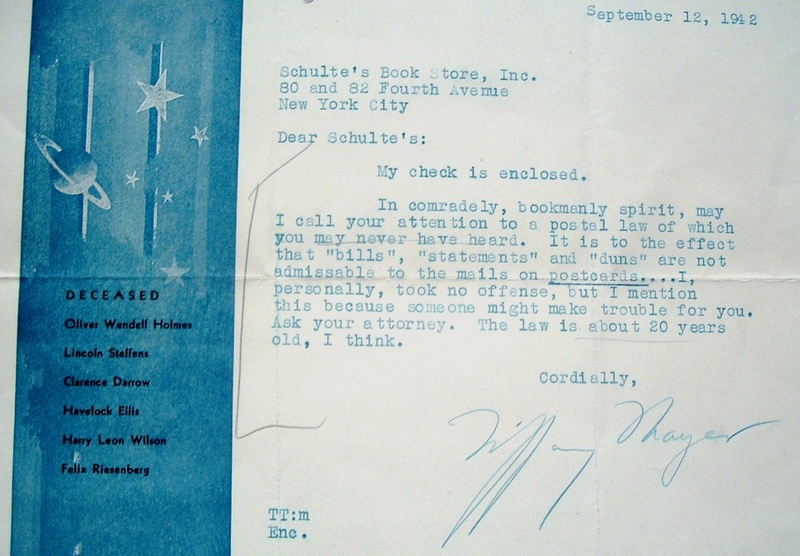 Back to the letter that's the subject of this post, Thayer seemed to have a good relationship with his bookseller, Schulte, and didn't want to see him in trouble over misuse of the US Postal System. And so, in "comradely, bookmanly spirit," he let Schulte know about the errors of his ways in using postcards inappropriately. I, for one, am grateful that Thayer was thoughtful enough to enlighten Schulte and that Schulte kept his correspondence and that other collectors and dealers down through the years have preserved this letter because I now get to enjoy it in my collection and learn about a society, its literary members and beginning, and its namesake who wanted nothing to do with it.